Mia Öhrn has a solid background as a food writer and baker. She writes for several of Sweden’s largest magazines, and has also published 18 books from how to start a café (or maybe not after all …) to French pastries. 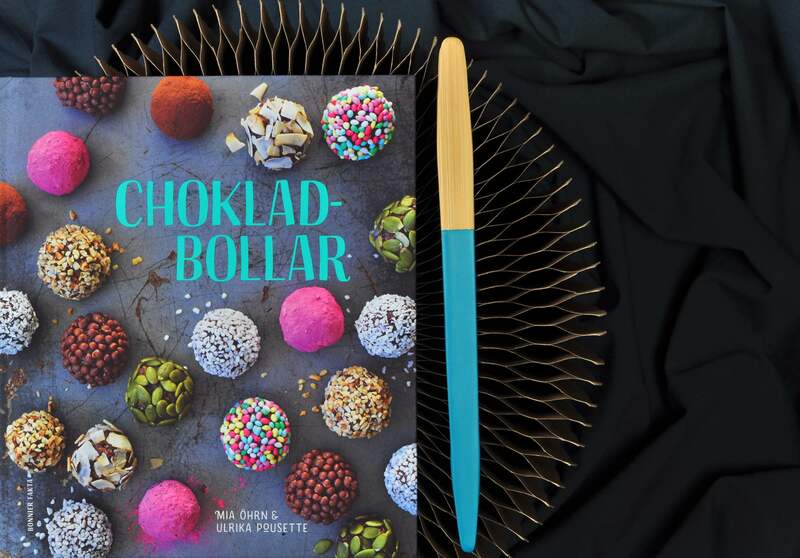 Now the author has taken on another Swedish classic – the chocolate ball. It can’t be anything but good! Chocolate balls are super easy to make, contain common ingredients and are usually cheap to make. And even though the book is called “chocolate balls”, there are a whole lot of versions without chocolate in the book, what about chickpeas balls with licorice and figs, “semmel”balls with marzipan or maybe matcha tea balls with hemp seeds? The book is written in a very easy way with simple instructions. The recipes are accompanied by stunning photos with a beautiful styling. Small toy cars are loaded with some goodies, colorful small plates are garnished with edible flowers and lovely cups with golden edges filled with hot coffee. Everything well thought out and lovely to look at! The recipe I have chosen from the book is really nice. The combination of white chocolate and lemon is almost unbeatable. And when you get the roasted, white, crispy chocolate around it is like opening a door to candy heaven. …. Sweet, sour and easy to make must be a great combination. The roasting of the white chocolate could maybe be a bit tricky but don’t worry, it’s easy if you are attentive on the oven so it doesnt get burned. Chop the white chocolate roughly for the balls to be rolled in later. Spread it out on a sheet of baking parchment. Roast it in the middle of the oven at 175 degrees C for about 10 minutes until the chocolate has become golden brown. Stir occasionally and be careful so it doesn’t get burned. Allow to cool and chop the chocolate roughly. Break the chocolate to the dough in pieces. Add it to a food processor with rolled oats, butter, sugar and lemon peel and juice. Mix for about 3-4 minutes to a fairly smooth batter. If you haven’t got a food processor you can melt the chocolate instead and then work together the ingredients in a bowl. 3. Shape the batter into balls and roll them in the roasted white chocolate. Allow to solidify in the refrigerator and then keep cold. This recipe is free from lactose and gluten (if you use gluten-free oats). Keep in mind that vegan white chocolate often contains some kind of nut- or almond butter.